Since taking ownership in 1993 the Wallut and Roy de Blicquy families have been knocking out some pretty smart booze from their Chateauneuf-du-Pape vineyards. Although I have no information as to the precise blend of this wine I’m guessing it’s predominantly Grenache, with Mourvedre and Shiraz and possibly up to ten other red varieties. So, here’s the gen on the 2005 ‘Les Vieilles Vignes’. A dullish brick-red colour greets, slight browning at the edges but still retaining some purple hues. Tarry, charry black plum and cherry lead the way on the nose, with meat and spice – star anise, cardamom – some marzipan character and a touch of VA (it's OK). There’s some brambly earth and blackberry, red raisined currants, and a little leafy black tea and herb. The structure of this wine is pretty sound. Firm yet approachable tannin, relaxed acid, supple texture, mid-weight and a reasonably lengthy sweet finish. On the flavour-ometer we get black cherry, rasberry/blueberry, earthy, gamey and pretty much all-round grenachey-ness. There was a muddy coffee character, some tar,licorice and coconut, and a certain marshmallowy sweetness that was highlighted when combined with our spare ribs and pork belly and rice. I almost forgot about the oak treatment because, quite frankly, I didn’t really notice it – I’m sure it’s there and supporting the structure perfectly, but it melds so effortlessly with the savoury flavours it doesn’t stick out. I liked it. Quintessential Rhone and probably best tried with food. More savoury than sweet – it handled the spiciness of the ribs and the salty crispness of the belly nicely. A bloody nice wine from a bloody nice vintage. Value: This aint cheap. I picked this up at a bargain rate from a mate who was changing his wine-list, but I think in the big wide world you’d pay near-on $80 for it. Big number, wine is good, you be the judge. Producer: Domaine de Villeneuve – www.domainedevilleneuve.com – owned since 1993 by the Wallut and Roy de Blicquy families. 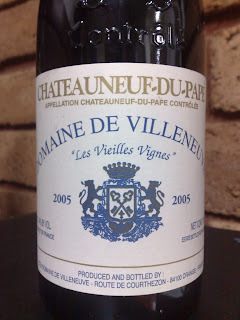 Region: Chateauneuf du Pape, Rhone Valley, south-eastern France. Site: A mixture of red clay, silt and pebbles – some sites on silt, clay and fine sand – a real historical maritime area. Vintage: Outstanding. Warm, but not hot, with cool nights. Wines will be long-lived.